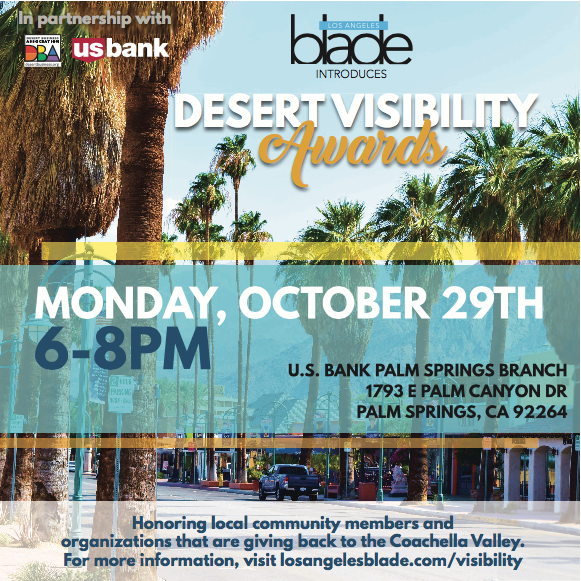 Please join us for the first annual “Desert Visibility Awards,” sponsored by the Los Angeles Blade, with partners U.S. Bank and the Desert Business Association. These awards will recognize LGBT-focused organizations, community leaders, activists, and others from around the Coachella Valley to honor their efforts in enhancing our community – and our communities. Los Angeles Blade is the LGBT weekly newspaper serving Los Angeles and Southern California, inclusive of the Coachella Valley, with 30,000 copies weekly in print and more than 175,000 monthly online visitors. The newspaper also publishes the 50 year old Washington Blade and is a member of the White House Press Corp. The Desert Business Association (DBA) is comprised of over 250 LGBT and allied businesses and professionals from across the Coachella Valley. Established in 1979, the DBA is one of the oldest LGBT business associations in the country, and the second oldest in California. Our vision is to connect, promote and build prosperity by embracing all members of our community to make a positive difference. More information at DesertBusiness.org.